"Excerpt from Mail Call: Ginny Simms Introduces Tito Guizar"
Tall and dashing, as well as enormously successful, Tito Guizar is often likened to his contemporary, North American Singing Cowboy, Roy Rogers. His career spanned 70 years of recording and film work. Born in Guadalajara, Jalisco, Mexico, Guizar was encouraged in his singing by his mother. However his conservative father wanted him to study medicine. Telling his family that he would attend Columbia University's medical school, he found New York to be a hot bed of activity during the early days of radio. Ranchero singers, including Negrete, Jesus "Chucho" Navarro Moreno and Alfredo "El Guero" Bojalil Gil were all seeking radio and recording work. Guizar played several Prohibition-era night clubs until landing a spot on radio, and he dropped out of school. 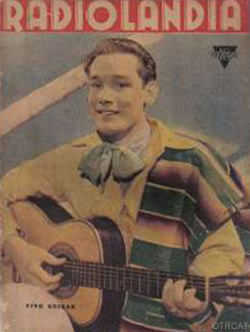 Moving to Los Angeles for his radio show, Tito Guizar y Su Guitarra, Guizar was able to land a few minor film roles for Warner Bros. 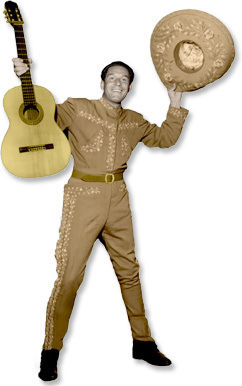 In 1936 he would be offered the leading role in Alla en el Rancho Grande. The title song from the movie would become Guizar's signature song. The song describes an idyllic life in the Mexican countryside, and is often compared to Roy Roger's Happy Trails. Guizar would get the chance to appear with Roy and Trigger in the 1948 film, The Gay Ranchero, playing Nicci Lopez, Sheriff Roy's sidekick. Collection contains 5 rare broadcasts from various series in which Tito Guizar makes a guest appearance including episodes from Duffy's Tavern, Its Time To Smile, Hello Americans (Orson Welles), Mail Call, and Quiz Kids. See also: Tales of Mexico in Old Time Radio, Fernando Lamas, Lupe Velez, and Carmen Miranda. Be the first to comment on "Tito Guizar"